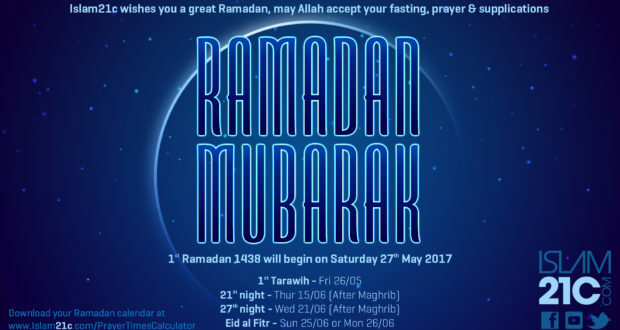 The 1st day of the sacred month of Ramadān 1438 will be on Saturday, Tarawih is set to commence on the night of Friday. Please remember to support Islam21c this Ramadan with your generous Dua and donations. Click here to help us reach our £20,000 target this Ramadan for developing a brand new website and our first ever mobile application. Take advantage of the Daily Ramadan Companion for daily activities to help you get the most out of everyday of this blessed month here. Previous: What caused Ramadān 1438 declaration confusion? Next: Is LBC’s firing of Katie enough to combat Nazi ‘Solutions’?